How much do Amish interact with the public? It’s a broad question, without a straightforward answer. Two recent stories show Amish crossing boundaries of sorts. On the whole, Amish are less likely than your average American to call the police. They have been criticized for this reluctance, particularly when criminal matters are involved. Amish have cooperated with the law in the recent Ohio beard and hair attacks, however. Arlene Miller, wife of one of the beard-cutting victims, explained why they pressed charges: not for revenge, but to help others in Sam Mullet’s group. “We don’t believe in fighting,” she said. “We do believe in turning the other cheek, but in this case there’s nothing wrong with struggling to get away,” she explained to an AP reporter. Is Dennis Miller’s church’s Ordnung explicit about not contacting police? That is an interesting question. My first thought is he meant it was simply “the way things are done” in his community, but maybe his group directly covers that point. Either way it sounds like he is sympathetic to the idea, at least in this beard attacks case. Attitudes to the police vary among Amish. Amish adhere to Two Kingdoms beliefs, which can be taken as a basis for avoiding resorting to worldly authorities. Amish involvement with police after the Nickel Mines shootings has been seen as one example of increased cooperation and changing attitudes towards law enforcement. Amish famously refuse government assistance. They also avoid commercial health insurance plans, relying instead on community plans and cash contributions from the church. One family in New York has reluctantly gone public in the hopes of saving their son, who has a rare medical condition. One-year-old Amos Hertzler cannot eat regular food, because he was born with esophageal atresia–meaning his esophagus does not connect with his stomach. He is fed every four hours by a feeding tube in his abdomen. Surgery to fix Amos could cost $250,000 or more. Amos’ parents and community have decided to go public in the face of the costs. They have arranged a public auction, and have given an interview to a Buffalo newspaper. 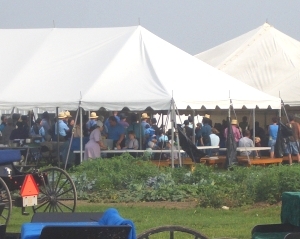 Benefit auctions are actually quite common among Amish. I think the reluctance here stems from the group involved. The best-known Cattaraugus County Amish group (often referred to as the Conewango Valley group) are known as Troyer Amish. They are technologically similar to conservative Swartzentruber Amish, for instance using oil lamps and no indoor toilets (see Johnson-Weiner’s New York Amish for more). The Hertzlers’ community, however, seems to be not the Conewango Valley people, but a much smaller Cattaraugus County group nearby, of a single church district. By the reporter’s description, they too seem to be quite conservative, though. In the story, they say they’ve never held a benefit auction before. An extensive news story in a major state paper is also a bit more coverage than you’d get for your typical benefit auction. The willingness on the part of Amos’ parents to go to media probably indicates the direness of the situation. “It’s not an emergency, but it’s the next thing to it”, said Amos’ uncle. This also makes me wonder how the community has been able to respond to the need themselves. The more conservative Amish groups tend to be less wealthy. I’m not sure what ties this community might have with the much larger Conewango Valley group, or in other settlements. In any case, it sounds like the eventual cost for Baby Amos’ treatment could well exceed the estimate. Reluctance to participate in worldly institutions is a hallmark of Amish practice and belief. The lines can blur, however, and as we see in these and other cases, Amish of different stripes respond differently in different situations. I will tell you what I find beautiful about the Amish and Mennonite communities. They help one another: in this way, they form a true society. The rest of us North Americans have been formed by what I consider to be an often unhealthy preoccupation with competition rather than co-operation. Looked at in Christian terms, we perceive our fellow human beings as competing with us: for work, for commodities, for prestige, for respect, for status, etc. There is a sickness to it all that the Amish work very deliberately to exclude from their lives. Yes, we have A LOT to learn from the Amish–especially as regards isolation and this constant (and very artificial) need to constantly best each other. In the Amish way I see much serenity. Paul, I agree with what you said 100% and I believe that is what so many are recognizing and why they are drawn to learn more. They will admit to having problems of their own, but by & large, we have alot to glean from them. And the irony is that while some mainstream people look at the Amish and Mennonites and think of them as “freaks”, Amish folks are probably riding out this recession better than many in the mainstream! And it’s precisely their values–what materially focused and smug people pejoratively call backward–that are showing their timeless wisdom. Thing is, you just can’t lose with a humble, reasoned relationship with material goods. But, if you overreach your abilities and chase after stuff and image–these things can prove very ephemeral and unreliable. Yes, our society has much to learn from the Amish. It’s interesting, for sure. It seems that the community under attack had already tried it their way (excommunicating Mullet, and followers). I noticed in a video interview posted earlier how clearly Mullet wanted to stress that this was religious business, so local law enforcement had essentially no jurisdiction (paraphrase). Playing this card, it seems to me, might have some pretty negative repercussions for the Amish when it comes time for them to rightfully use this point. I wonder about the Anabaptists of history – the ones who were martyred for their religious convictions… Do you suppose they would have accepted the aid of public law enforcement had it been available to them (I’m assuming it wasn’t due to combination of Church and State)? It was not available to them, as they were martyred by the State. Their only choice was to flee if they could. As theologically conservative Anglicans, and Plain people, who think much as the Amish do about being involved in the world. We did accept my husband’s Canada pension ofr his disability, as it required contributions from him throughout his working life, and he does not qualify for the church pension for two years more. We would not be exempt from contributions to our national pension plan, as msot Anglicans do not see any issue with it. Involvement with the police as victims of crime would be another matter. Although we have lost farm tools and household items to theft, and have even known who (probably) took them, it would not be likely we would go to the police. First, they were items of low value and the injury was slight, and as in the well-known “turn the other cheek” passage, Jesus also says to let the robber have your tunic as well as your cloak. We don’t have many items of greater value. If someone were to steal our only vehicle, I would prefer to call in the police for its possible recovery and to help stop the criminals before they got a taste for the work and started robbing other people. The possibility that anyone would steal my 2004 beat-up Dodge Dakota is pretty low, though. I think the assaulted Amish in this incident were right to cooperate with the police. The threat remained that it would happen to someone else,and violence escalates. This Bergholz group, from what I hear, needs to be checked. They have caused trouble before and can’t rightly be cosndiered as truly Amish since they have crossed the line of violence. While even Amish people may strike out in anger occasionally,a nd family violence isn’t unknown, this was planned as revenge, far from a Christian action. As for the little boy who needs medical care, if someone will provide a contact address for his church, perhaps other people here would like to help. I will publicize the need if I have more information. I really appreciate your articles and your forum. I live near many Mennonite and Amish communities in upstate New York. As I Christian myself I try to respect others, as Jesus did. When it come to a number of situations with the Amish, I can’t help but think that this really boils down to “situational ethics” in it’s purest form. When something occurs, the response varies so widely between groups– depending on what the elders of that particular group decide is ethical for their own group. I guess that’s harmless in most cases, unless it causes anguish between groups, or physical danger in the case of women drowning due to wearing skirts, for instance, or a child who is too close to some dangerous farm equipment. Seems like each elder ruling group makes up the rules and uses the Bible as their excuse…..and that certainly isn’t the first time in history that has been done…. I’m not quite understanding how wearing skirts would drown a woman. (I’m pretty sure I can swim in a dress, for instance, having done so.) And children other than Amish are injured and killed in farm accidents each year. Amish having no health insurance has always been an interesting point to me. Mainly because I know just how expensive health care can be. My son recently spent 5 days in the hospital having his vp shunt revised and the hospital bill was over $80,000 (usually it is just a 1 to 2 night stay). I am very happy to have health insurance! While our community has been helpful – they did a benefit for us right after Isaac was diagnosed with cancer – it wouldn’t even make a dent in the medical bills if we didn’t have insurance. I have admiration that the Amish are able to raise the funds themselves for their medical care. Thank you for providng the address Eric (and Magdalena for asking). I pray this little boy gets the surgery he needs soon.